Unique activities to do with the kids on on the hottest days of the year! The kids are home for summer vacation and your house is hot, your car is hot, you’re hot! No matter what you are doing the heat is sweltering. We are going to give you a few unique activities that you can do with the kids to help the hot days of summer pass faster than they otherwise would. All you need for this project is a popsicle mold, cornstarch, walter and washable tempera paint. Just mix one part cornstarch with one part water and add the paint to get the desired color you want. Throw everything in the molds, and stick the molds in the freezer. Wait until the liquid is frozen, and pop the popsicles out of the mold. There you have it, perfect summertime chalk fun. The kids will love using this all over the driveway and watching all of the colors as they melt and dry on to the pavement! For this unique activity you will need 9 half full disposable water bottles and some water balloons that are filled up and ready to go. Set the bottles up like bowling pins and then roll the balloons on the sidewalk from about 10 feet back or so. This game takes some skill to get the balloon to the bottles without having the balloon pop. 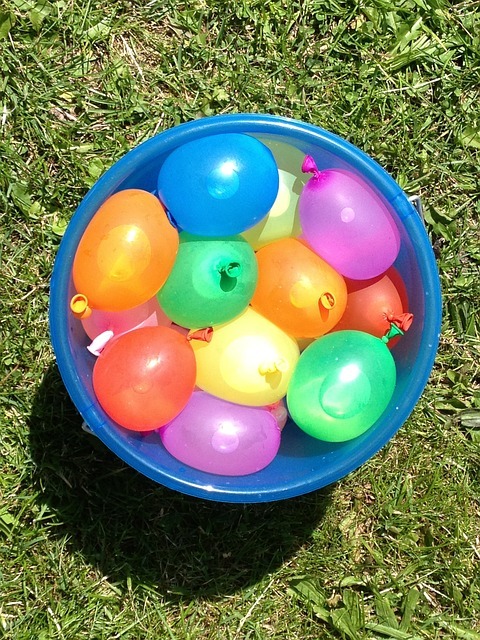 Easy and good fun, your kids will be entertained for hours as they play water balloon bowling. Everyone loves a treasure hunt and in the heat an ice treasure hunt is all the better. Pick up a few small toys at the dollar store that will not be affected when frozen in water. At home get the largest bowl you have that will fit in the freezer. Put the toys in the bowl and fill the bowl with water and place it in the freezer. Wait till everything is frozen and then remove the ice covered toys and and place the block somewhere outside. Give the kids a few tools and let them loose trying to excavate the toys from the ice. Hopefully these ideas give you some way to pass away these hot summer days with a little more enjoyment. You will be glad the kids are busy and the kids will be glad that they have a fun new summer time activity to do!